Musical – Well, Here's Another Nice Mess . . . Stuck Here in The Middle With You. 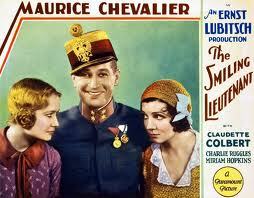 Working on my Lubitsch gap, I watched The Smiling Lieutenant (1931) with Maurice Chevalier, Claudette Colbert & Miriam Hopkins. A little bit of Chevalier can go a long way; but Maurice is still fun. Miriam Hopkins (in just her second film) is good as the staid Princess Anna who emerges as a, well not exactly a swan–but she does emerge. It is Claudette Colbert character Franzi though, who provides the real heart and soul of the film. Her passionate free-spirited Franzi is the one left by the wayside at the film’s bitter-sweet conclusion and we are made to really feel her loss. I’d be remiss if I didn’t mention Charlie Ruggles; who shows up for a few scenes early as an army buddy of Niki’s that drags him out of bed to go to a beer-garden so then he can conveniently meet and fall for Franzi; and George Barbier as the King and father of Anna. They lend more than able support. Ernst Lubitsch also made The Shop Around the Corner, To Be or Not To Be and Trouble In Paradise among others that you should seek out if you haven’t already. This is one of the main reasons for me to continue with Netflix DVDs. I don’t stream movies; but how could I get a chance to see this beauty without the invaluable service I get from the much maligned Netflix. They ain’t perfect; but I get access to films I would have otherwise. On the other hand, they are not keeping up with new “old” films on disc and often have the oldest versions which they are not quick to replace. Oh, well.